Founded in 1957, Carlsbad High School, located in Carlsbad, California, serves almost 2,400 students in grades 9-12, including over 1800 athletes. Carlsbad High School empowers students to become successful learners, creative thinkers, and contributing citizens in an environment dedicated to excellence, respect, diversity, and tradition. Students and staff work together to develop a community where diversity, acceptance, and tradition are respected and create an environment where students feel comfortable and thrive. In 2018, Carlsbad High School was named America’s Most Spirited High School, which speaks to a direct correlation between school spirit, community and school involvement, academic achievement and self-confidence. By partnering with REPu, the Lancers are able to keep their students, fans, and community engaged in an easy-to-use and interactive way. “One of the biggest things that helped me as an administrator and athletic director is that the app is really simple to use. 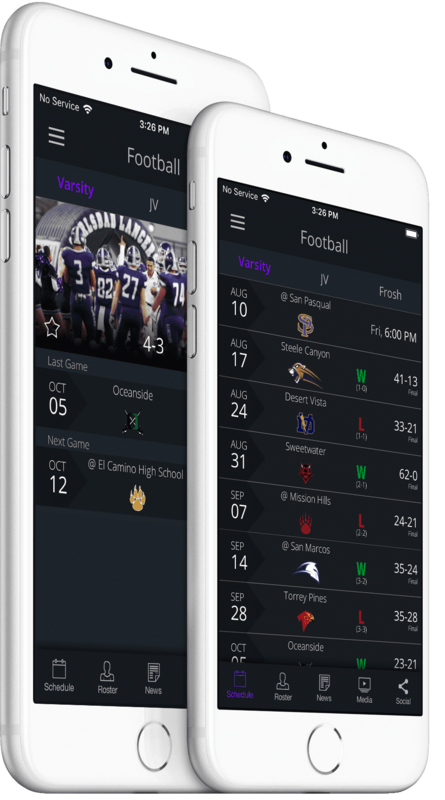 It takes about two minutes a day to go in and make sure all the scores and schedules are updated,” Amanda Waters, Carlsbad Athletic Director, describes the REPu digital platform. “The app doesn’t have to be just for sports. It can be for our student sections, ASB, choir, band, and the dance teams who perform at games. The coolest part is that REPu has given us an app that’s branded to Carlsbad High School and Lancer sports,” added Jeff Riccitelli, Carlsbad ASB Director. The REPu mobile app allows for schedules, social media posts, game results, and news/photos to be shared through one easy-to-use platform. Follow along with Carlsbad High School by downloading the Lancer Sports app from the App Store or on Google Play.